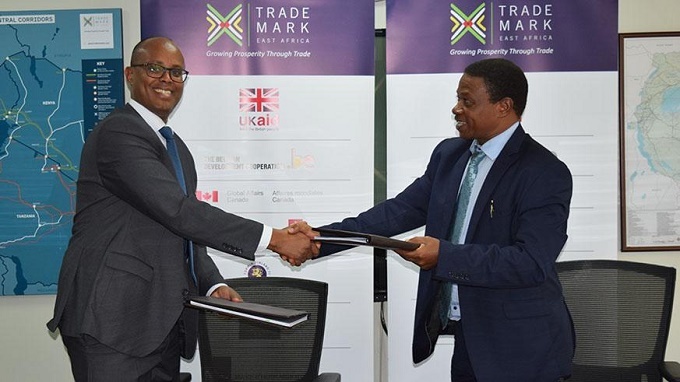 TradeMark East Africa (TMEA) and the Northern Corridor Transit and Transport Coordination Authority (NCTTCA) sign a 3 year grant extension agreement worth US$ 1.05 million for Strengthening and Enhancing the Northern Corridor Transport Observatory. On 17 April 2018, in Nairobi, TradeMark East Africa (TMEA) and the Northern Corridor Transit and Transport Coordination Authority (NCTTCA) signed a 3 year period (2018-2021) grant extension agreement worth US$ 1.05 million for Strengthening and Enhancing the Northern Corridor Transport Observatory. TMEA has been supporting the Transport Observatory project since 2012. The Northern Corridor Transport Observatory is a performance monitoring tool with an online portal to track and monitor the performance of the Northern Corridor. The observatory has three components namely the main observatory, the GIS component, and the northern corridor performance dashboard. The main Transport Observatory tool monitors 35 performance indicators on a regular basis while the dashboard is used in monitoring the implementation of the Port Community Charter that commits various stakeholders, both public and private to increase efficiency at the Mombasa Port and along the transport logistics chain in Kenya on a weekly, quarterly basis. Through these monitoring tools, the NCTTCA Secretariat is able to track the performance of the Corridor as per indicators categories namely; Volume and capacity, Transport rates/costs, Transit time/delays, Efficiency and productivity, Intra-regional trade and Road safety and provide evidence-based recommendations to the stakeholders and policymakers. The Northern Corridor, a multimodal transport system which includes the Port of Mombasa, roads, railways, pipeline, inland waterways, border stations, weighbridges, transit parking yards and inland container depots designated by the Member States, links the landlocked countries of Burundi, Democratic Republic of Congo (DRC), Rwanda, South Sudan and Uganda to the sea port of Mombasa-Kenya. Establishing the Transport Observatory Engagement Forums. Collected and analysed Data will continue to support evidence-based policy formulation, advocacy and decision making in the Northern Corridor Member States.